India Buddhism - HISTORY'S HISTORIESYou are history. We are the future. During the later part of the Aryan Period in India, the idea of reincarnation became very strong among Hindus. Most people believed that after you died, you would be reborn in another form, and then reborn again, and again, forever. However, not everyone liked this idea. Some didn’t want reincarnation to just go on and on forever. Wasn’t there any way to stop this, they wondered, to get off the wheel of reincarnation and just be? In the 6th century BCE a young Indian prince named Siddhartha Gautama had an idea. He thought that you could get off the wheel of reincarnation if you were good enough and pure enough. The history of Buddhism is the story of Siddhartha’s spiritual journey to enlightenment, and of the teachings and ways of living that developed from it. Behind Hinduism and Judaism, Buddhism is the 3rd oldest religion in the world. ​Today, there are nearly 400 million Buddhists worldwide. Brain Box: What makes an idea a religion? CLICK above to learn more about the Buddha's life. Who was Buddha? Prince Siddhartha Gautama, who would one day be known as the Buddha, was born into a royal family in ancient India nearly 2500 years ago. Because he was royalty, he was insulated from the sufferings of life - sufferings such as sickness, age and death. The prince had parents who loved him, many servants to wait on him, the finest clothes, and a different palace for every day of the year! As the prince grew up, his life became even more wonderful. Everyone who met him liked him. The prince had a warm heart, two doting parents who loved him, a beautiful wife, and a brand new baby boy to fill his life with happiness. 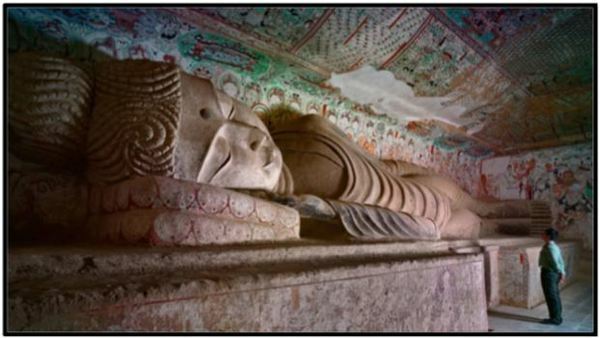 The statue above is in the Mogao Caves, Dunhuang, China. CLICK to learn more about this sacred Buddhist site. Discovering Cruel Reality: One day, after growing up, marrying, and having a child, Siddhartha went outside the royal compound where he lived. When he went outside he saw, each for the first time, an old man, a sick man, and a dead man. As you can imagine, this greatly disturbed him. From the experience, he learned that age, sickness, and death were the inevitable fate of human beings, a fate no one could avoid. With all his wealth, with all his treasures, and in spite of his loving family, the prince found that he could not be happy. He found his world full of suffering and it upset him that painful old age, sickness, and death were all part of life in this world. That did not seem fair to him. Why did Siddhartha leave his comfortable life and home? Meditation remains a key component of Buddhist practices. Becoming a Holy Man: On his trip outside of his family’s royal compound, Siddhartha had also seen a monk. The prince was amazed that this monk could find calm and peace in a world filled with such sufferings. That very day, he made a very difficult decision. He decided to leave his wealth, his comfort, his wife, and his newborn son. He decided that, upon leaving his protected royal life, he would live as a homeless, holy man. A Life of Self Denial: The more of the world Siddhartha traveled, the more suffering the world showed him. Still, he continued on, searching for a way to escape the inevitability of old age, pain, and death. On his travels, Siddhartha encountered an Indian holy man who encouraged him to follow a life of extreme self-denial and discipline. In addition to practicing self-denial, the Buddha also practiced meditation but concluded that, in themselves, the highest meditative states were not enough. After practicing meditation and extreme self-denial for six years, he was still not satisfied. He still had not escaped from the world of suffering. With neither extreme suffering nor extreme luxury, the middle way leads to happiness. The Middle Way: Realizing that if he continued in a state of such extreme self denial he would end up not just skinny but dead, rather than enlightened, Siddhartha abandoned the strict lifestyle of self denial. He did not, however, return to the pampered luxury of his early life. Instead, he pursued the Middle Way, which is just what it sounds like - neither luxury nor poverty. Enlightenment: One day, seated beneath a fig tree, Siddhartha became deeply absorbed in meditation and reflected on his experience of life. He was determined to penetrate its truth. While meditating beneath that tree, an understanding came to him. The understanding that came to Siddhartha was a way to end suffering. 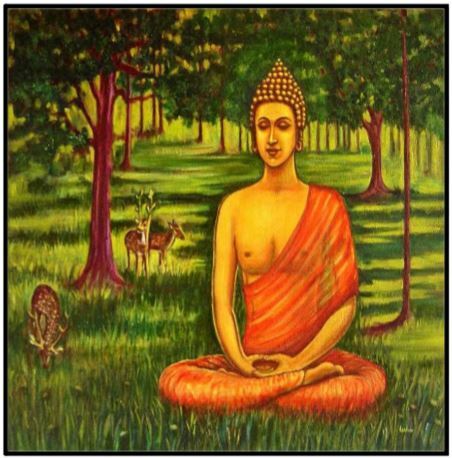 On that day Prince Siddhartha Gautama began to earn a new title, the Buddha, which means “Enlightened One.” Since then, the tree under which he sat is referred to as the "Bodhi tree." Bodhi is a Sanskrit word that means "enlightened" or, more closely, "awakened." At first the Buddha was happy to dwell within this state of enlightenment, but Brahma, king of the gods, asked, on behalf of the whole world, that he share his understanding with others. 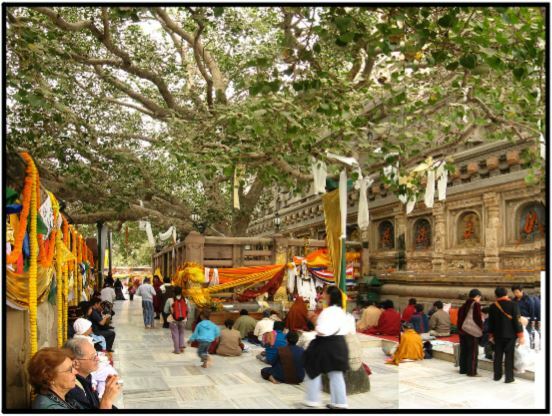 The Bodhi Tree is where Siddhartha reached enlightenment, thereby becoming the Buddha. In the 3rd century BCE Emperor Ashoka the Great built the Bodhgaya Temple next to it. CLICK on the picture to learn a bit more about this sacred Buddhist site. Buddha set in motion the wheel of teaching. Rather than worshiping either one or many gods, Buddhism centers around the timeless importance of the "teaching," or the dharma. For the next 45 years of his life, the Buddha taught many disciples who later became Arahants or "noble ones," those who had attained enlightenment for themselves. Brain Box: How are the 4 Noble Truths, The 8-Fold Path, and the Middle Way connected to each other? • Life is filled with suffering. • Suffering is caused by people’s desires. • Suffering can be ended if people stop wanting things, like more pleasure or more power. • To stop wanting things, people must follow eight basic guidelines, called the Eightfold Path. The Eightfold Path is a guide for living according to the Middle Way. In brief, these are the 8 basic guidelines of the Eightfold Path. Without making life either too strict or too easy, the Eightfold Path was designed to guide people toward enlightenment. The Middle Way is the name Buddhists call lives guided by the laws of the Eightfold Path. Buddha spent the rest of his life traveling around India and sharing his message with everyone. He had many followers who lived according to his Four Noble Truths. Some of his followers became Buddhist monks. They gave up all they owned and depended on other followers and kind-hearted people to give them food. Their message was one of love. After the Buddha’s death in 483 BCE, Buddhism spread rapidly throughout Southern and Eastern Asia. Buddhists everywhere live by Buddha’s teachings, which were written down as proverbs. A proverb is a short saying that expresses a simple, agreed-upon truth. Buddhist texts are called Sutras. An example of a sutra can be seen at left. Sutras helped spread Buddhist teachings beyond India, often by way of the ancient Silk Road. Below are a few of Buddha’s proverbs, from an ancient Buddhist text written in about 100 BCE - over 2000 years ago! "Hatreds never cease by hatred in this world; by love alone they cease. This is an ancient law." "Happiness is not getting what you want but, instead, wanting what you get." "As a solid rock is not shaken by the wind, even so the wise are not ruffled by praise or blame." "It is not right to compare yourself with another. The only true comparison is between you and your former self." The Goal of Buddhism is to become the "Greatest Person in the World." Buddhism teaches that being the greatest is an absolute achievement free of comparison. What does that mean? It means that to be the greatest is not an achievement that can be attained through competition. You can’t win greatness, but you can achieve it. That means everyone can be the greatest at the same time. Here’s an example: For a healthy ant to successfully carry one grain of rice is a great achievement. For a healthy horse to successfully do the same is not a big deal. The ant has put his best effort into his job. It has fulfilled its purpose as an ant. When this truth is achieved, the ant is no longer just an ant. It has become the greatest ant in the world. Buddhism teaches that a person is successful not because he or she received a higher grade, or won a gold medal at the Olympics, or beat out other ants to see who could carry the biggest and heaviest grain of rice. True achievement does not come from competition or comparison. The basketball players to the right might not defeat a team of professional all-stars, but that's not the point. Even with their handicaps, the players pictured can be the best that they can be. For the follower of Buddhism, a person - or an ant, or a horse - is successful because he or she has done the best they can do. For this reason, all of us can become the greatest person in the world, all at the same time. Why is the Buddha pictured as laughing? Have you ever seen a ceramic statue of the Buddha, perhaps in a Chinese restaurant or in your home or garden? Have you ever wondered why the Buddha is laughing? The laughing Buddha reminds us that to be happy, we need to have a loving heart. By not being resentful, by not bearing grudges, only then are we able to smile like the Buddha - only then can we be truly happy. Buddhism values love, wisdom, goodness, calm, and self-control. Buddha was a living example of those attributes. As such, Buddha is one of the Three Treasures of Buddhism. The other two treasures are the Dharma (the teachings) and the Sangha (the community of followers of Buddhism). Together, the Three Treasures help guide one's actions. Buddhists believe that the Buddha and his teachings should be honored, that people should try to end suffering, that they should follow the Eightfold Path. Following the Eightfold Path leads to enlightenment, and that is important because it is what distinguished Buddhism from other early Indian religions such as Hinduism. While both Buddhism and Hinduism believe in reincarnation, Hinduism relies on the caste system to assign one's role in society - and there is no escaping one's caste. The Buddhist belief in enlightenment, the belief in one's ability to move beyond the endless cycle of suffering, also provided believers the hope that they might escape their assignment to a lowly caste. Early on, that difference aided the growth of Buddhism. In ancient India, people thought of Buddhism as a chart of behavior that they could follow to lead them to a life beyond the grave. With nearly 400 million Buddhists in the world today, Buddhism is a major world religion and one of the fastest growing religions in the West. CLICK the button to the right to go to a complete online video course about Buddhism.